US, 1984, 153 minutes (Director's Cut, 2001, 180 minutes), Colour. F. .Murray Abraham, Tom Hulce, Jeffrey Jones, Elizabeth Berridge, Simon Callow, Roy Dotrice, Charles Kay, Christine Ebersole. Amadeus won eight Academy Awards including Best Film and Best Actor. It is an enjoyable and exciting piece of film-making. Peter Schaffer (also an Oscar winner) adapted his stage play for the screen, opening it out and changing emphases. While there is a portrait of Mozart, there is a study of mediocrity and professional jealousy in Salieri. The music, under the direction of Neville Marriner, is also an important ingredient in the film's success. Much of it was filmed on location in Europe and the film is a collaboration between American and Czech film-makers. F. Murray Abraham gives a superb performance as Salieri - in fact two performances, one as the middle-aged Salieri and the other as the older Salieri. 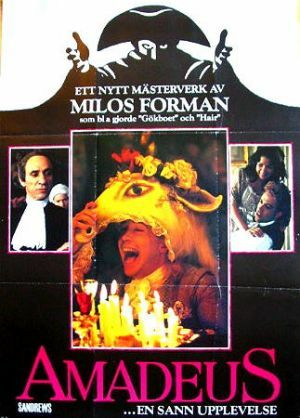 Tom Hulce's performance as Mozart is somewhat off-putting at first with its laughter and crude behaviour - but it is a subtle portrait. The supporting cast does not have the uniform excellence that might have been expected - but Jeffrey Jones is outstanding as the Emperor. 1. The film's acclaim, awards? Deserved? A visual and aural experience? 2. The work of Peter Schaffer? Stage, screen? The adaptation of his play? Opening it out, the visuals? The use of locations - associated with Mozart? Symbols? Characters? Dialogues? Music and the interpretation of the music? 3. The talent engaged on the film: European, British, American? Impact? an age? Its artificiality and beauty? The age of Enlightenment and culture? 5. The homage to Mozart's music? The quality of performance,	Neville Marriner's selection, the music as background, inserted into the plot? Atmosphere of its composition, performance? Drama? The insights into Mozart and his genius, performance, composition, conducting? The soundtrack? The visual equivalents of the music? The experience of the music? Salieri's explanations, delight and wonder (as well as jealousy)? Mozart's experience and gifts? 6. The structure of the film: the focus on Salieri, his illness and madness, violence. his transition to the asylum, the confession to the priest? A confession becoming a real and vindictive memoir? The focus on old Salieri: his relish of his past, malice, regrets, memory, re-living the past, his comments, the truth of his appreciation, his exorcising his memories, his final malicious look? The insertion of himself and his memories into the flashbacks? His background, the comparisons with that of Mozart? His composing, teaching? The interrelationship with Mozart? His verbal point of view and the visuals of Mozart? Mozart's progress, impact, career and genius? The ultimate thwarting of Salieri? 7. The device of Schaffer's creating the story of Salieri: his perspective, irony, the priest and the confession? A subtle method of biography, theme, study, interpretation? 8. Eighteenth century elegance and beauty, music, the traditions of the theatre, the profane and the sacred, aristocratic, class distinctions, pomp and pomposity? Reason and inspiration? Traditional themes for music and opera? Contemporary stories? Culture? Vaudeville? The role of music in Europe? The expectations on the composer, the chapel musical director, the director of the theatre, the court composer? The nature of patronage and the effect on the composer (as a servant)? Patronage and ignorance, censorship and control, ignorance and jealousy? The absolutism of power? The echoes of the past and its elegance? Echoes of revolution -especially reference to the French Revolution? The ordinary people - the streets. the markets. the brothels, the audiences at the vaudeville? The gap between the ordinary people and the aristocracy? 9. The film's probing of the theme of genius: creative, a gift, abilities, an interior power possessing the composer, delight and beauty, driven, its toll? Self-confidence and lack of self-confidence? Appreciation? The theme of the worthiness of the bearer of God's gift of genius? Expectations? Mozart as vulgar, coarse, common, his language. behaviour, manners, mannerisms, his laugh, taste? Yet the vulgarity transcended when he composed, conducted. appreciated? (The use of Americans for the roles and the broad American accents - highlighting the theme?) The comparisons with the ordinary, the average. the mediocre? Pomposity and ridicule? Decorum? Control and censorship, shock? The conclusions about the genius of Mozart - a vulgar man but his music not vulgar? Salieri's genius in being an appreciator? But his wanting to be a creator, his giving himself to God, his disillusion with God in God's dispensing of his gifts, his wanting to get back at God for not making him a composing genius? 10. The theme of jealousy, obsession, a man being consumed, dedication, image, false hopes, disgust? Salieri and religion -his childhood, his prayers, his father dying, the crucifix and providence, the gift, himself being an instrument of God, his vocation, his being scandalised at Mozart, speaking to God, appalled. burning the crucifix. hatred, wanting to defy God by people acclaiming Mozart's Requiem Mass as his own? His finally being consumed, living for 32 years on his memories? Was Salieri ever pardoned of his jealousy? mediocrity? His final passage through the asylum corridor giving Benediction to all mediocrities? 11. The portrait of Mozart: a child prodigy, his blindfold piano playing, performance, seeming as a performing monkey? The influence of his father? The teaching of his father? The Archbishop of Salzburg's patronage? His being considered as a servant, humiliated? A young man and his playfulness with Costanza? Vulgarity, cheekiness to the Archbishop, his rude bowing away from the Archbishop? The transition to Vienna? The challenge of writing an opera in German? The arguments for and against German opera? His antagonism towards the Italians at court? A clever musician, his memory, playing Salieri's march from memory? The success of his opera The Seraglio? His joy in performance and conducting? The relationship with the opera star? The marriage proposal, his marriage (and his father's absence)? His domestic life -composing, sloppy house, continual need for money, extravagance? Troubles at court about The Marriage of Figaro and its being banned in the Empire? The ballet without music and the Emperor's pleasure at the music being reinserted? The Emperor and 'too many notes'? The arrival of his father, the party and the masks, the game, playing Bach upside down, mocking Salieri? His response to Salieri's opera - and diplomatically ambiguous praise? His trusting Salieri for help? His growing older, sicker? The vaudeville show and the mocking of his opera? His love for his son? The writing of The Magic Flute, conducting it, his collapse? The brothel sequence and his ill health? The commission to write the Requiem, the continued presence of his father's stern portrait, the masked patron as his father? Finishing the Requiem with Salieri? Dying happy? The pauper's funeral? The film ending with Mozart literally having the last laugh? 12. Salieri as a boy, family, Italy, his prayer, providence and his father's death, going to court, his being the Emperor's teacher, court composer? The banquet and his delight in Mozart's music. watching in continued disgust at Mozart's behaviour? His triumphal march for Mozart and its being ridiculed? His opera and its lavish style? His interview with Stanzi and his amazement at Mozart's manuscripts? Seeming to be on Mozart's side? Conspiring with the Italians at court? His commissioning the maid to work in the house and spy. discovering Mozart's secrets, the operas? His continued presence at the performances? Commissioning the Requiem - and his plan to take it over as his own at Mozart's funeral? His presence at The Magic Flute. helping the ill Mozart, working with the Requiem and his delight in working? His being thwarted by Stanzi and Mozart's death? 13. Salieri in old age - living in the palace, his focus on eating. his madness about Mozart and his having murdered him? The servants, the cutting of his throat? Talking with the priest, testing the priest about his own and Mozart's music? Shrewd and manipulating? Not forgiving or forgetting? The end of the film - and Salieri starts a new day? 14. Genius and madness? Mozart and the dominance of his father. his mocking and poking faces at his father's portrait? Salieri, the asylum, the inmates? 15. The court, the Emperor and his power, absolutism, opinions, advice? Germanic nationality? The influence of the Italians? Censorship? The advice of the Chamberlain? His attending performances? Appreciation of music? 16. Stanzi and the opening playing with Mozart, the young girl, her vulgar mother? Her mother's fainting in the Emperor's presence, sending Stanzi away, berating Mozart (and ending up an influence for the Queen in The Magic Flute)? Her love for Mozart, family, Salieri and the manuscripts, her business head, her not welcoming Mozart's father, attacking him, her disgust with the vaudeville, her exasperation with Mozart, her forbidding him to do the Requiem, the impact of his death, her presence? 17. Mozart's father: his power over his son, teaching him, Mozart's defying him, going to Vienna? His absence from the marriage? Arrival, dominance in the house, the masked games - and the double face: frowning and smiling? Squabbles and leaving? His death? The Commander in Don Giovanni as the father influencing and dominating Mozart from the grave? Salieri's realisation of this, his buying the costume, pretending to be the ghost of Mozart's father and tormenting him? Mozart's mocking reaction to his father's portrait? 18. Mozart, his friends, frivolity, ordinary citizens, the vaudeville audience and Mozart's love for them? His plea for contemporary art for mass audiences? 19. Performance, music, the operas: The Seraglio, marriage of Figaro, Don Giovanni, The Magic Flute? The Requiem? 20. An appreciation and interpretation of Mozart?